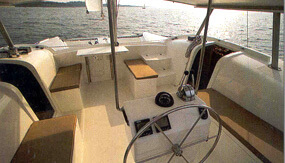 Daily sails from 9-12:30 and 1:00-4:30 $85.00 per person+tx. Snacks and drinks included. 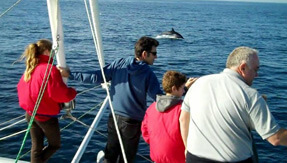 Fun Cat Sailing offers the best whale watching tours San Diego has ever seen during the season! 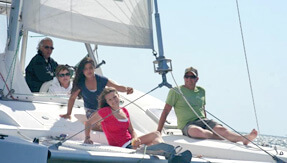 Our stable smooth sailing catamaran offers the best whale watching in San Diego. Quietly under sail, we can approach the whales in a way that doesn’t scare them and allows them to continue their natural behavior. Join us this whale watching season in San Diego on a whale watching, wildlife, and dolphin adventure tour from San Diego Bay. Breathe the fresh air, take in the scenery, and experience the magnificence of seeing Whales, Dolphins, Sea Lions, and Sea Birds in their natural environment. If you are looking for adventurous ideas for San Diego day trips, Fun Cat Sailing offers the best whale watching California has! We provide quality tours with a personal touch. Our trips are fun, informative and interactive, which sets us apart from other San Diego whale watching tours. We are dedicated to making your trip of wildlife & whale watching in San Diego an experience of a lifetime. Stay warm and relax in our wind/rain protected cockpit, or venture forward onto our sunbathing nets. Non rolling catamaran design ensures a comfortable ride out to see the whales.